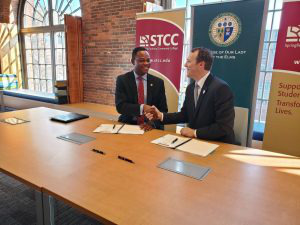 The College of Our Lady of the Elms and Springfield Technical Community College (STCC) have signed an agreement to provide students interested in majors such as computer science, information technology and security with several new computer-related bachelor’s degrees. The partnership will allow STCC students to transfer from the community college into the Elms College accelerated online bachelor’s degree programs in computer science and computer information technology and security, according to MassLive. In order to be eligible for the program, students are required to be enrolled in one of the following STCC associate degree programs: computer information technology and security, programming, computer systems engineering or engineering and science. This isn’t the first time that the two schools have collaborated on a bachelor’s degree program for STCC students, said Betty Hukowicz, dean of the School of Graduate and Professional Studies. The two partnered in 2011 on the bachelor’s degree in social work. Brian Candido, a professor and chairman of the Computer Information Technologies department at STCC, said the new program will allow students to work while they pursue their bachelor’s degree. The courses will be offered in seven to eight week modules to prevent students from being overwhelmed with material. Elms will utilize a variety of online methods for course instruction such as YouTube videos and Moodle, an open-source learning management platform.